The call came around 4:15 p.m. in the afternoon. 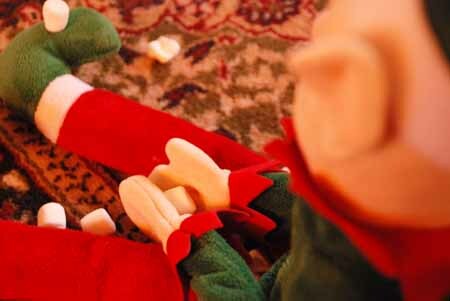 My son was at a friend’s, when I learned that the Elf, who finally made his appearance just a few days before, got into a messy, yet amicable, scuffle with an Elf pal, at the friend’s house. 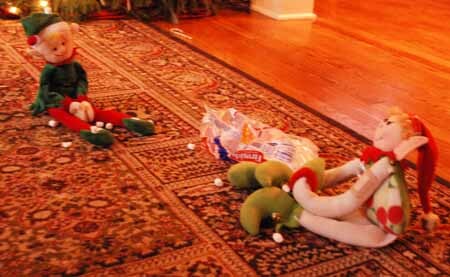 Marshmallows were strewn all over the floor, as the Elves pelted each other, one after another, with the marshmallows. The floor was a mess; the ripped-open bag of marshmallows sat between the two of them, further incriminating them in the fiasco. Elf didn’t even bother to hide the marshmallow we found in the palm of his hands. We cleaned up the mess, and ended the play date early, as the Elves, clearly, could not behave themselves. 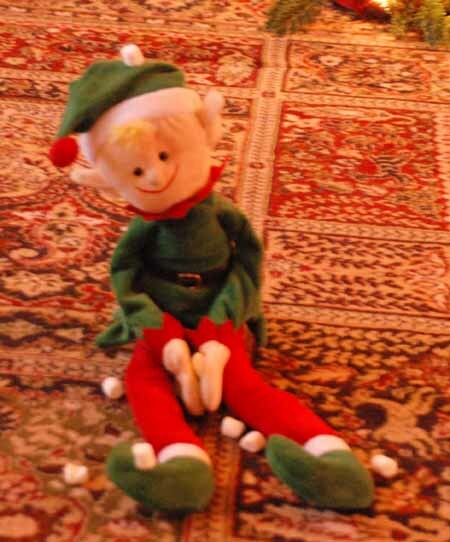 Jani–tell your son to remind the kids at school that you’re not supposed to tell about your elf. (it says so in the book!) Maybe their elves will go away if they find out their secret has been told. Jani, Heather is right. According to “Elf on the Shelf” book (not our particular Elf breed), you are not supposed to “touch” your Elf. If you do, he can’t go back and tell Santa how good you were. But seriously, this whole thing is just NUTS! When it gets to the point where kids hurt each other — that’s a problem. Thankfully, our Elf was a gift, and we have one Elf for the family — yet it belongs to just one of our boys. And everyone seems to be fine with that.